Two groups of researchers have cooled a cloud of atoms until they became what was essentially one big super-atom. Although not the very first so-called Bose-Einstein condensate to be made, it was constructed using novel atoms. These atoms paired-up as they cooled, changing the properties of the gas and allowing an insight into its nature. Superconductivity - the phenomenon in which electrical resistance vanishes in a material - may be better understood because of this latest research. 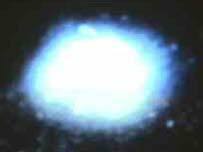 In 1995 scientists made a Bose-Einstein condensate (Bec) when they cooled a cloud of rubidium and sodium atoms to within a few billionths of a degree above absolute zero, the coldest anything can theoretically get (minus 273 Celsius). The feat earned the researchers a Nobel Prize. At close to absolute zero, atoms interact in such a way as to become, in effect, a single giant ensemble atom. The first Bec had unique properties which will help scientists probe the basic behaviour of matter. Further understanding is also expected to revolutionise applications in fields that include precision measurement and nanotechnology - making tiny structures such as those used in computer chips. Now researchers, at the University of Innsbruck, Austria, and the Joint Institute for Laboratory Astrophysics in Colorado, US, have made a Bec using a different mixture of atoms. They have used potassium-40 and lithium-6 atoms which differ in fundamental ways from the previously used atoms. The most important difference in this context is that the new atoms are classified as fermions. Atomic particles can be divided into either fermions or bosons, depending on a property called quantum mechanical spin. Bosons have integer spin, such as photons which have spin 1. Fermions, like electrons with spin of 0.5, have half-integer spin. What happens is that the fermions combine as the gas cools so that the combination has integer spin. In effect, two fermions behave as one boson. This may shed new light on superconductivity, the phenomenon which sees electrical resistance vanish in a material. Its effects are believed to arise when electrons pair-up to behave like bosons. Some of the fundamental research behind superconductors won this year's Nobel Prize for Physics. Superconducting materials are made from metals, alloys and ceramic compounds. Their lack of resistance has led to them being used to make powerful magnets, such as those found in magnetic resonance imaging (MRI) scanners which probe the body's tissues. 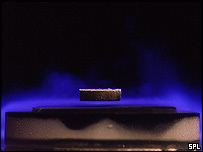 Atom smashers also use these magnets to hurl particles at each other to study the fundamental properties of matter. Although the field has been plagued by hype, it does promise significant improvements in superfast computing and in the super-efficient generation, storage and transmission of electric power. The latest Bec research is published in the journal Science.